Canisius College has announced Beaty will become its new Director of Public Safety. She will replace Wil Johnson, who retires in May after three years in the position. “Kim’s experience as chief of 'E' district and her expertise in community policing and diversity training make her uniquely qualified to head the college’s Department of Public Safety and support the mission of the college,” said Terri Mangione, vice president for student affairs and Title IX coordinator. “I am confident that with her leadership, Canisius will maintain our relationship with our Hamlin Park neighbors and build new relationships within the communities on the East Side of Buffalo." Beaty is a Canisius graduate and the recipient of many awards. Her current duties as deputy commissioner of operations and homeland security include being a facilitator of diversity and community policing training at the Erie County Law Enforcement Training Academy. She will retire from the BPD in June to take her new position. 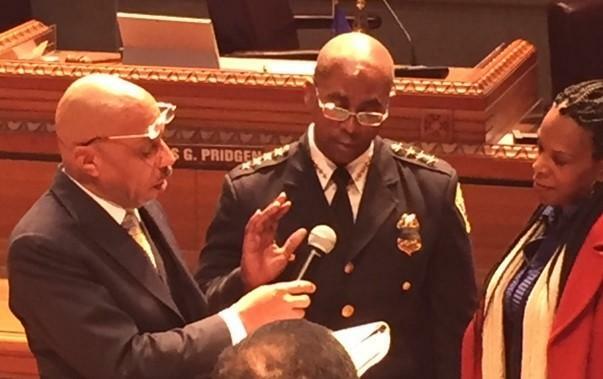 Buffalo has a new police commissioner, with the Common Council unanimously approving and then swearing in Byron Lockwood for the department's top job. Lockwood replaces Daniel Derenda, who retired to take a private-sector post. A big change is coming to the Buffalo Police Department. In an overnight press release to media, Mayor Byron Brown announced the abrupt retirement of BPD Commissioner Daniel Derenda.